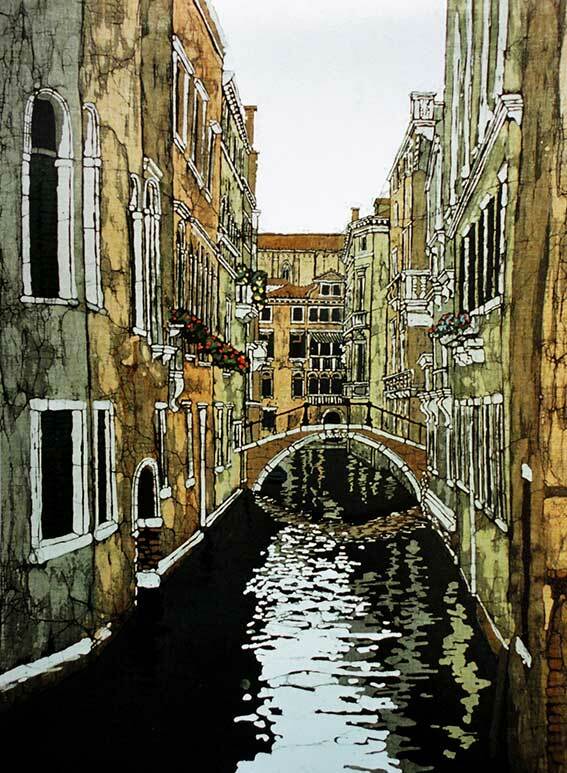 This large back-lit original Batik 'Venice Canal' is now displayed in my hall at home. It was the first of a series of paintings I did following the first of many wonderful trips to Venice that I took with my mother starting in the early 1990's. We both completely fell in love with Venice. I would spend the days walking with my camera (that first trip I shot 5 rolls of film!) and my mum would do galleries and museums. Venice itself is enough of an eyeful for me. I am fascinated by the reflections in the water and have been trying to reproduce them in Batik ever since. I must have been down every back alley and over every bridge by the end of the week, exploring the bits where the tourists don't go, watching real Venice going about its business.